WASHINGTON (CNN) - Authorities are looking into a "suspicious letter" delivered to the residence of Republican Sen. Susan Collins in Bangor, Maine, local law enforcement said at a news conference Monday. "Today at 1:39 p.m., we responded to a residence on West Broadway to investigate a suspicious letter," Bangor Police Department Sergeant Wade Betters said ahead of the news conference. "Members of our Criminal Investigation Division are currently on scene and the investigation is ongoing. The Bangor Fire Department and a HAZMAT team from Orono, Maine are assisting the investigation," Betters said. At this time, the Bangor Police Department has no information to suggest that the public is in danger, Betters noted, adding that the FBI has been notified. During the news conference, Betters said he had no information on the contents of the letter or the identity of the sender, but said that he believes it was delivered to the house. The reason the letter had been sent to the senator's residence was also not immediately clear. "Mr. Daffron, their dog, and parts of their home were quarantined while the crime lab undertook an analysis of the premises," the spokesperson, Annie Clark, tweeted. "The affected areas have now been cleared, and Senator Collins and Mr. Daffron will be able to remain at home tonight." The investigation into the letter's origins and the testing of the letter remain ongoing, Clark continued. "Today's incident is the latest in a series of threats against Senator Collins, her loved ones, and her staff," Clark tweeted. Collins has recently been subject to intense political scrutiny over her pivotal role in voting to confirm Brett Kavanaugh to the Supreme Court. The Maine Republican, who was considered a swing vote on the nomination but ultimately supported Kavanaugh, was the target of anti-Kavanaugh protests in the run up to the final confirmation vote, including at her residence in Bangor. Kavanaugh, who has been accused of sexual assault but denied the allegations, was confirmed by Senate Republicans along a party line vote earlier this month with just one Democratic senator voting in favor of the nominee. "We'll take it, and process it, and utilize it to work in the investigation," Betters said when asked what happens to the letter now. Betters indicated that it has yet to be determined if this would be considered a federal crime, saying, "that depends on how the case unfolds." "We're the primary responding agency, so that kind of falls to us and our jurisdiction. But then we turn the case over to the US Capitol Police, potentially federal investigators to see it through," he added. 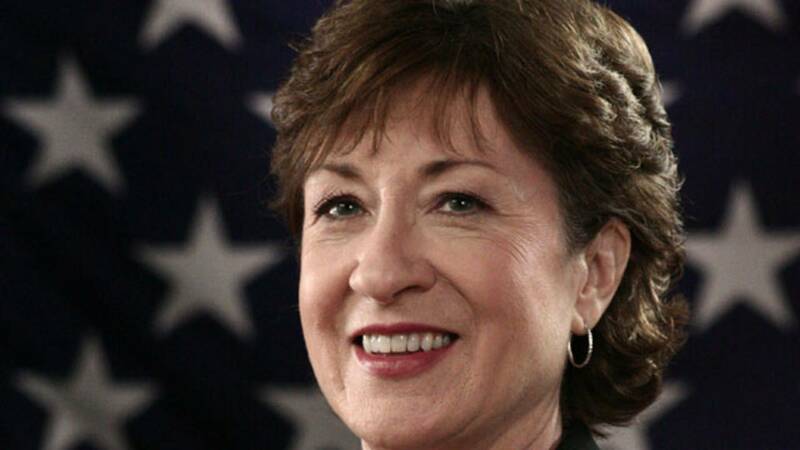 Collins tweeted Monday evening and said, "We are very grateful for the immediate and professional assistance that we received. ... We are also truly appreciative of the many well wishes that we received today." "Our friends and neighbors have been incredibly kind and have even offered to open their homes to us," the statement continues. "We feel blessed to live in such a supportive community."